It took me some time to decide whether I should bother to make comments about Desmond Zammit Marmarà’s article ‘A party with no future’ (February 1), but then after revisiting the comments that appeared online, I felt compelled to expand on some of them. Readers referred to the article as “a short-sighted view of history”, “a lot of nonsense”, “an attempt at re-writing history”, “a very biased analysis by a Labour die-hard who is more inclined to beat the Opposition than proposing a better good governance by his leading party” and “foolish, partisan and inaccurate prattle”. Not exactly an accolade to make one feel proud. Zammit Marmarà has a history of writing articles which appeared to be on the side of what is right but then fell short of demanding action from Labour leaders in government or opposition. I remember the writer using the maltastar.com (January 30, 2008) to warn Labour supporters not to fall into the trap of answering me for my many articles/letters about the MLP’s violent past and other aspects of Labour’s policies that in my view harmed the country. In my articles in this paper I always mentioned that those violent Labour supporters only did what they did because they had the patronage of politicians. Hence none of them were taken to court to answer for their misdeeds. History seems to be repeating itself. Today we are faced with an institutional breakdown which resulted in a culture of impunity. But it is in truth worse than that. Joseph Muscat, who Zammit Marmarà described as a great statesman, has actually rewarded people who in the past have broken the law which is truly the wrong message to send to the country and our European partners. One of his first appointments was that of Cyrus Engerer as an envoy to European institutions in Brussels when he had just been found guilty of criminal offences and received a suspended sentence. He then proceeded to send Karmenu Vella as Malta’s Commissioner at the EU who as a minister back in 1983 had been found guilty of breaking immigration rules when he and Labour MP John Dalli entered Għadira without the permission of customs authorities. Yes, of course his name has been cleared because of prescription rules, but no one can write away history and what’s more the two Labour politicians were never investigated for unloading a number of boxes straight into a seaside restaurant and a waiting taxi. The history of impunity by Labour goes back a long way. Muscat then proceeded to appoint Toni Abela to the court of auditors in the EU who was rejected by the European Parliament only to be replaced by Leo Brincat who suffered the same fate because of his lack of opposition to Konrad Mizzi and Keith Schembri’s Panama Papers involvement. Muscat ignored the vote and he got his way by taking advantage of the convention of mutual sovereign respect at the council of ministers. Lesser mortals with a criminal background have found themselves in positions of trust in several institutions but the chickens seem to be coming home to roost as some of them have allegedly disgraced themselves in no time at all. Zammit Marmarà finished his article with what can only be described as a rant. He objected to the accusation that this is “the most corrupt ever” government. And wait for it, “people want proof, not allegations”. This is the oldest trick in the book. The Panama Papers are not an invention. The fact that the highest ranks of Muscat’s government put into action their plans to make themselves rich in the shortest possible time, just a few hours after being sworn in back in March 2013 should be proof enough. And the opening of the Panama companies and the timing of the Vitals deal were no coincidence. Zammit Marmarà demands proof of the allegations – then let’s set him some homework for his next article of “foolish, partisan, inaccurate prattle”. Why are allegations not being investigated by the police, same as happened back in 1983 under another corrupt Labour government? Why is Muscat trying to delay justice if not suppress it altogether in a number of court cases relating to corruption? Please, do let us know next time round. 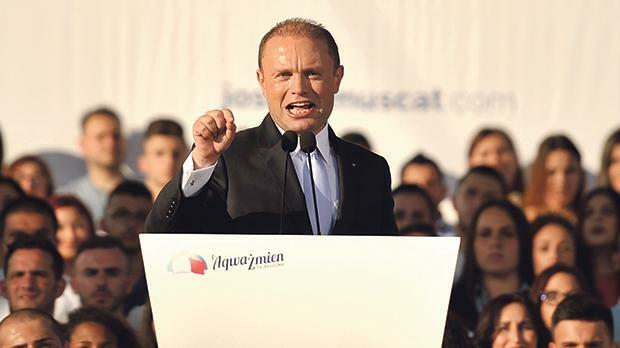 And why did Muscat vote against Chris Said’s motion in Parliament a few weeks ago that if passed would have resulted in a fair and equitable investigation in all the allegations found in Daphne Caruana Galizia’s Commentary? The Labour Party has ended up with two former high ranking officials, former treasurer Joe Sammut and a former general secretary Jimmy Magro facing corruption allegations. In the former case, the eleven charges were made in court back in 2015. Guess who was part of the prosecution team? A certain Inspector Jonathan Ferries. And when is Magro going to face charges? We were promised transparency and accountability. All we get from Muscat are snide remarks when he’s faced with serious accusations. Let the Nationalist Party sort itself out, but give it time. Worry about the country. Zammit Marmarà’s worries about Labour’s violent elements in the past are very well documented in an article in this paper (June 28, 2008) when he praised Alfred Sant for having eradicated those elements and therefore “for that alone, his place in history is assured”. Today we have a different type of violence perpetrated by Muscat and his corrupt allies in government and party which can only continue if they are allowed to get away with it. Muscat’s strength comes from the collective weakness of those around him among whom I have little choice but to count Zammit Marmarà.